Preparations for local government reorganisation in Northamptonshire are moving ahead despite councils continuing to wait for a formal Government decision. 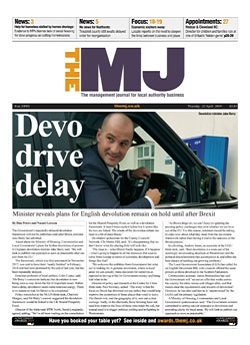 Continuing concerns around the future legal base of regulatory work after Brexit will be raised at the next EU exit local government delivery board, The MJ understands. Council chiefs have raised concerns with Government about the sector’s capacity to run EU elections so close on the heels of local polls. Local government has welcomed plans to axe ‘no-fault evictions’ in England as a ‘first step’ in improving housing security. A group of Northamptonshire MPs has urged the Government to sign off reorganisation plans for the county. Birmingham City Council’s intervention team has issued a final, damning report on the crisis-hit council and walked away – despite admitting its job is not complete. Extra funding could be available to councils to cope with the fallout from a no-deal Brexit, the communities secretary has said. There is ‘much more to do’ to improve the quality of Northamptonshire CC’s services, two Government-appointed commissioners have told Whitehall. The local government sector has urged the Treasury to continue funding the Troubled Families programme following a glowing report on its impact. Local government secretary James Brokenshire has faced a barrage of Brexit concerns from councillors. Civil servants have insisted they are working to improve information sharing with local authorities around Brexit. Councils will only be able to get their hands on part of the Government’s £1.6bn funding boost to deprived communities. Lancashire CC’s leader has given a lukewarm response to plans for a new unitary council.